Annual Jackbox Party Pack games are something we’ve come to expect. They’re always more than welcome as they provide countless hours of entertainment through mobile device-console hybrid technology, and Jackbox Games continues to find new ways to innovate their party-making system. In Jackbox Party Pack 5, Jackbox Games took a few risks while bringing back an old classic, You Don’t Know Jack, which has been absent from the mix since the first Jackbox Party Pack. Other than this, everything is new, and in some ways, experimental. The games continue to use the classic formula of “use your mobile devices as your controller by logging onto Jackbox.tv,” so there isn’t anything new players will need to know about. The new sponsors of the You Don’t Know Jack series. You Don’t Know Jack is back, and it’s as funny as ever. This time, the theme of the game seems to be that the game is over a streaming service, where each question is sponsored by something. At first, it felt like these were real sponsors, but then I remembered what I was playing. Half of the humor of You Don’t Know Jack is poking fun at how serious other trivia games can be. Personally, I prefer my Google Assistant, so I don’t appreciate the shade. To put it bluntly, You Don’t Know Jack is a trivia game. You and up to seven other friends compete for the highest score by answering questions poised by Cookie Masterson. These questions can be from a large array of topics, including the kind of alcohol used in a Pina Colada. There are also new question types that require typing in an answer rather than simply selecting one through multiple choice. The saddest part about this game is that I’ll never see every other “video” being recommended to me. The game is primarily unchanged at its core despite a few new question types, but it doesn’t need any radical changes to be a fun time. The questions are there, players falling behind will be able to “screw” other players occasionally to force them to answer or lose double points (or gain double points), and Jack Attack has a new spin where more items to be selected as part of the category will be uncovered over time before expiring. Even the font is reminiscent of a different time. 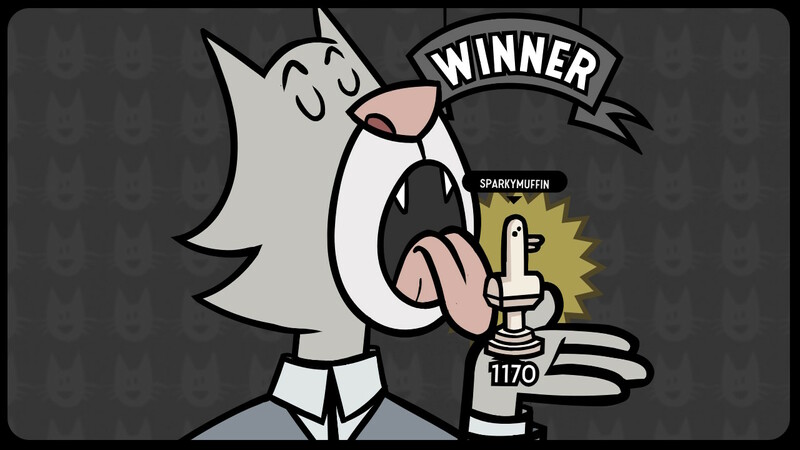 While several of the games in the Jackbox Party packs featuring prompts rely on other people voting on the best answer, Split the Room has a more unique setup. With a Twilight Zone aesthetic, one person fills in the blank of a question, and the other players will vote on whether or not they would say yes to the hypothetical scenario. For example, one of the questions may say that there is a bank that gives a $1000 signing bonus, but the ATMS are only located inside ____. The player puts an answer into the blank, and the other players vote on whether or not they’d do it. The player that answered the prompt has to make a divisive answer, as they will not get points if everyone says yes, or if everyone says no. To get points, they have to “split the room,” and splitting it perfectly (half on one side, half on the other) will earn that player the maximum number of points. My friend had a real story to go with his answer. It’s depressing that he’ll never get to “Let it Rip!” again. The game can lead to funny answers and situations, but there is a drawback to this. Someone can put in a nonsensical answer and it will end up being completely random on whether or not other players vote “Yes” or “No.” This is a potential drawback that only occurs if someone in the room is being a sourpuss. Otherwise, there isn’t much to “Split the Room.” It’s a fun little distraction, but definitely not the main attraction of Party Pack 5. Let’s tear down the roof! …then the rest of the building. There is only one thing better than giant robots, and that’s a giant robot rap battle. Mad Verse City takes the concept of a rap battle and filling in prompts to create a wonderful blend of Microsoft Sam hilarity. In this game, you’re first asked to throw in one word. It’s usually a noun or an adjective. Next, the first line of your rap is revealed using the word you gave. You can write anything you want in the next line, but you’re trying to impress the other players, not the game. This same setup continues for the third and fourth lines. After the four line is written, the verse is complete and two players robots will go head-to-head in a rap battle. Whatever the player has written will be read out loud using voice synthesis. After both raps have been dished out, the other players will have the opportunity to vote for whoever had the most fire lyrics. After each round, the players closest to each other on the high score board will face off. Sadly, my friends are filthy and I can only show you Gene, the AI Player. If there is an odd number of players, Gene the robot will fill in for someone, spitting out a randomized line. Unfortunately, even though the game tries to encourage rhyming, the AI player will not always rhyme, creating awkward, sometimes nonsensical verses. Otherwise, this is one of the games we had the most fun with. While the text-to-speech isn’t perfect and may say things like “quotation,” it’s hilarious to hear the robots try to rhyme on beat. Patently Stupid is Jackbox Party Pack 5’s drawing game. However, the drawing portion is incredibly light this time around and only serves as a fraction of it. In Patently Stupid, everyone finishes a prompt to create a problem on a notecard. Next, you will receive two notecards on your mobile devices from players and will choose which problem to solve. After choosing, you will have a short amount of time to draw an invention on a canvas that suspiciously looks like a napkin. Once your masterpiece is complete, you add a title and a tagline. But, this isn’t the end of the game. You now have to present your invention to the room. You can choose whether to have the game talk about your invention for you, or for you to do a demonstration yourself choosing which order to display the invention, title, and tagline. Disclaimer: Jackbox will not automatically censor your answers. My biggest complaint with this game is that the automatic reveals feel stiff and awkward. It doesn’t feel like what they’re saying matches on the screen at all, but it’s better for people that don’t want to talk about what they made and instead want to go on with the game. After everyone has presented, players will bid on which inventions they liked the most. If you receive above a certain amount of money for your invention, you will receive a bonus amount for it. This process repeats for another round until you reach the final round where everyone solves the same problem. Now it’s time for something a little different. Until now, Jackbox Party Pack has only contained games that involve drawing and answering questions. Zeeple Dome is the black sheep of the collection, as it involves using your mobile device as a control to fling your character into aliens in a gauntlet-styled arena. To launch your character, you have to swipe your device in the opposite direction you’d like to go. Depending on how far you pull back is how hard it’s flung. Each player will have a different color, and in order to take out one of the aliens, the player with the same color of the alien has to be the one to give the finishing blow. There are also powerups and unlockables in this mode. As everyone is working cooperatively, there is an overall progression system as more things are unlocked through playing including new aliens. This progress is saved, so everything doesn’t have to be unlocked at once. Zeeple Dome is fun, but it can be frustrating to hit the aliens sometimes. You can only fling if you’ve hit an object, and often times the alien you need to strike will be in a frustrating area such as under a bridge. However, the game is incredibly forgiving, as you have lives on top of your generous healthbar. Jackbox Party Pack 5 is, like the name implies, another great pack of party games. Of all five additions, each of them offers something new, and even You Don’t Know Jack goes back to its trivia-question roots while bringing in fresh, new ideas. Zeeple Dome is an interesting experiment, and it’s exciting to see what Jackbox Games can do to evolve the mobile/console hybrid system in the future. Jackbox Party Pack 5 delivers on another great set of party games. You Don’t Know Jack returns better than ever, Mad Verse City has the potential to create plenty of laughs, Zeeple Dome is a successful experiment, and Patently Stupid mixes drawings and prompts in the most clever way yet. Even though Split the Room may be the least exciting of the bunch, it has its own charms and feels more like a “worst of the best” rather than anything less than good. You Don’t Know Jack returns in possibly one of the best editions so far. Zeeple Dome is a successful experiment at a cooperative action game.